Welcome to the Signalator website. 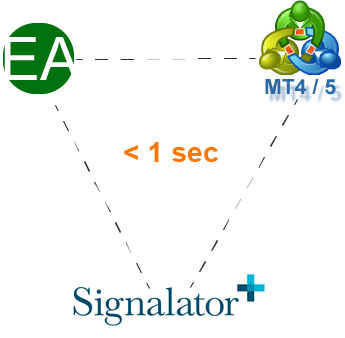 Signalator is a provider of profitable automated trading signals. Please use the following page as an overview and a guide to our services. If you want an extract of the Signalator website, please visit the Overview page. You will find answers on how to subscribe, what to choose and what to expect from using of our services. We provide forex signals for the major currency pairs (EURUSD, GBPUSD, USDJPY, Gold, etc.) Most signals are intra-day. The list of all available signals is here. All signals are sent by professional human traders. We always include SL / TP levels and we use market orders. Click here to check examples of signals delivered. Signals are easy to understand and are suitable for both novice and expert traders. With 100% automated execution of orders directly on your account (with free Signalator VPS) you will have to do virtually nothing to make the very best profits on the forex market. Signalator offers a number of subscription options to meet your requirements and expectations. You pay for the profits on your account. Further you will find useful help and info links. Contact us any time should you have any questions. Read what other clients say about using our services. The knowledge base with the most popular questions and answers 24*7. Find out what are our strong sides and how you will benefit from Signalator services. How to begin trading with Signalator? Trading on the forex market requires a forex broker account. You are free to choose any broker you like, no need to change a broker if you have one already. If would like to have trades executed automatically, consider choosing a broker with MT4 / MT5 (metatrader) platform. Please use the following page to choose the most appropriate type of signals. How much money do I need to begin trading? You may start trading on a demo account with virtual money. If you are interested in making some money, you will need at least $5,000 or equivalent to begin, otherwise any trading will be a time wasting. Signalator pays much attention to the risk management. We will take care of your risk to optimize your trading. Use the Signalator Investment Calculator to build up your own personal investment plan. Check the recommended deposit levels prior to choosing a subscription type. The final step is to choose the signals you want to trade with and the subscription type you would like to use for it. Click here for subscription options.